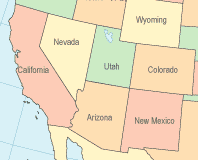 Immigration reform: Senate says Nevada is a border state. The Senate says so! In a vote yesterday that mostly Nevadans were paying attention to, the Senate agreed—handily agreed—to an amendment that gives Nevada a seat on the “border security commission” created by the current version of immigration reform. (Instead of 10 members, it’ll have 11.) And it wasn’t even close. Eight senators actually represent states with portions of the U.S.-Mexico border, and only one of them (you guessed it, Ted Cruz) voted against the plan. As a refresher, here’s a map showing how far Nevada is, physically, from Mexico. Opponents of the measure didn’t really organize against it, preferring to make fun of the crazy idea. But neither the pro-reform side nor most of the opponents had a problem with it; there are plenty of illegal immigrants making their way to Las Vegas, right?